Mike Greene - mgreene@shawmedia.com Paul Csech, of Crystal Lake, works on finishing details for Broken Oar's new second-floor outdoor deck overlooking the Fox River Friday, April 6, 2012 in Port Barrington. 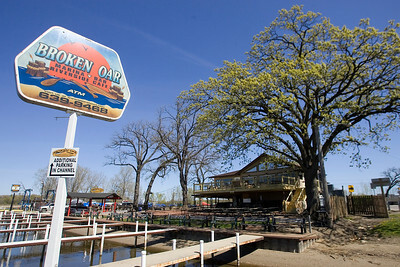 Recent construction at Broken Oar has nearly doubled their capacity. Mike Greene - mgreene@shawmedia.com The Broken Oar is currently finishing construction on a new second-floor outdoor deck overlooking the Fox River as seen Friday, April 6, 2012 in Port Barrington. The deck, which is awaiting final inspection, will feature 14 tables as well as a number of barstools. Mike Greene - mgreene@shawmedia.com Chris Seils (cq), manager of Broken Oar, works on setting up tables for a new second-floor outdoor deck overlooking the Fox River Friday, April 6, 2012 in Port Barrington. The deck, which will feature tables and barstools overlooking the river, has been in the works for about two years according to Seils. Mike Greene - mgreene@shawmedia.com Chris Seils (cq), manager of Broken Oar, secures the legs on a table for a new second-floor outdoor deck overlooking the Fox River Friday, April 6, 2012 in Port Barrington. The deck, which will feature tables and barstools overlooking the river, is nearing completion. 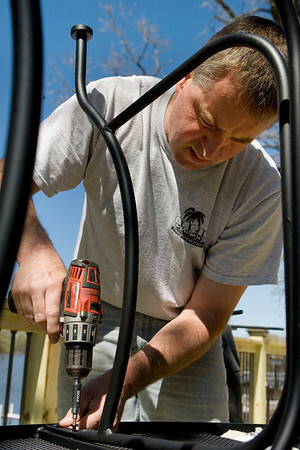 Chris Seils (cq), manager of Broken Oar, works on setting up tables for a new second-floor outdoor deck overlooking the Fox River Friday, April 6, 2012 in Port Barrington. The deck, which will feature tables and barstools overlooking the river, has been in the works for about two years according to Seils.